The Psalmist in Psalms 8 verse 5 tells us we were created a little lower than angels and we’ve been crowned honor and glory. We were created with some of the Creator’s own “stuff” in us in other words we’ve been created to be a cut above all of creation. One of the greatest temptations we face is the propensity of some to think more highly of ourselves than we should (Romans 12:3). And alongside that temptation is the propensity to think less of ourselves than we should. The temptation occasionally I struggle with is the tendency to think of myself less than I should. Pride has never been a struggle for me but I am sure over the years I’ve been quite a handful for Jesus as he’s helped me struggle through the temptation of misguided humility. While I am no expert in the “Human Sciences” I am an experienced human therefore I will humbly try to explain what I mean by misguided humility. 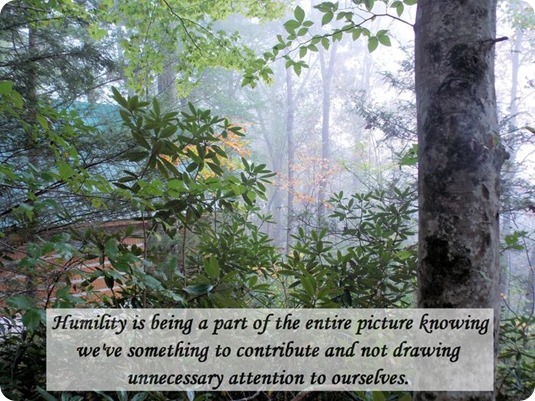 One of the ways I think of humility is being a part of the entire picture knowing we’ve something to contribute and not drawing unnecessary attention to ourselves. Misguided humility is when we realize we have a contribution to make and because we feel inferior or made to feel inferior we contribute nothing. Scriptures marked AMP have been takenfrom The Amplified Bible. (1987). La Habra, CA: The Lockman Foundation.